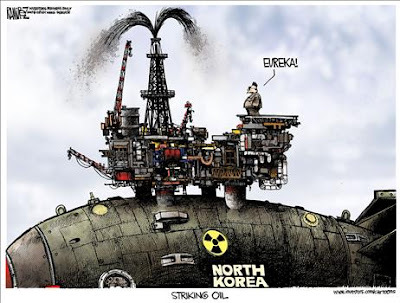 - Mixed reviews on the North Korean nuke deal. - I know of no team in all of pro sports that would have the hubris to celebrate 40 years of not getting it done like the Toronto Maple Leafs did last night. By the way, I thought the plural of the word "leaf" was "leaves". - Where do the Conservatives find joke candidates like this? - Unions: well past their best-before date. Luis Cabrera, a military adviser to the president, earlier had questioned the authenticity of the threat in comments published by local media. He said it was illogical that "al Qaeda, which is against North American imperialism, would go against a state that is fighting, though in a different way, against that hegemony." Cabrera may be right that al Qaeda views Hugo Chavez's Venezuela as a de facto ally and thus fairly low on its hit list. But what's interesting about his comment is how he ascribes his own ideology to the terror group. As we noted in September, Chavez himself, speaking before the U.N. General Assembly, slyly claimed the 9/11 attacks as an example of "rising up against American imperialism." In truth, al Qaeda's leaders do not see themselves fundamentally as fighting against "American imperialism," much less for Third World socialism. Theirs is a movement based in religion; their grievance against America is infidelity, not imperialism. President Bush has said repeatedly that the terrorists hate us because of our freedom. I don't believe that. The world's people have always admired our freedom. What they don't like is the arrogance and indifference to world opinion inherent in so much of our international policy. Plenty of my fellow citizens don't like that either. I'm not alone . . . Note how McGovern equates "terrorists" with "the world's people," then moves on quickly to "plenty of my fellow citizens" and finally to himself. It seems he is simply unable to imagine someone seeing the world through anything but a McGovernite prism. After 9/11, we kept hearing: Why do they hate America? It's an important question, but the inquiry is pointless if the only answer it yields is: For the same reasons I do. Obviously! Meanwhile, Steyn points out that even when the news from Iraq is good, the mainstream media treats it as bad. And two days after the Democratic vote on the troop surge, with Hillary shamefully reversing her position amid hollow claims of support for the troops, Iran's Ayatollah Khamenei is confidently predicting American defeat in the region. Certainly this is all just a coincidence. And what might a soldier have to say? See here.